Just 12 weeks after being assembled, the Irish Women’s 7s team have achieved their goal of qualification for the 2013 World Cup. For once, the IRFU took the initiative and they must be congratulated. However, the biggest plaudits should go to this talented group of players and their coach Jon Skurr. To have achieved such excellence in so short a time is nothing short of inspirational. In a season when Ireland’s senior men’s XV has failed to impress consistently, our female players and underage teams have provided much positivity. An interprovincial blitz at the start of April was the beginning of the journey, allowing newly appointed Women’s Sevens Coach Jon Skurr to cast an eye over the talent available to him. Skurr led the Men’s Sevens Team to the 2009 World Cup in Dubai, a squad that included guys like Felix Jones, James Coughlan and Paul Marshall. Gemma Crowley was brought in as Manager, having performed the same role with the fifteen-a-side squad. Other staff, like Munster Academy S&C coach Ross Callaghan, were brought on board to provide their expertise. Following that blitz trial, Skurr picked a squad of 21 players to move forward with. Each of the four provinces was represented, along with several Exiles. The entire process was well planned out, with a series of Sevens events targeted, building up to Moscow last weekend. The first tournament was the Kinsale Sevens on the first weekend of May. Under the team name Irish Lightning, an Irish squad of 13 players won the tournament, winning every single game and racking up some big scores. Importantly, a number of other players from the 21-woman squad played with other teams in Kinsale, picking up vital game time. A good start, but the standard would only increase. That certainly proved to be the case at the Amsterdam Sevens two weeks later. Again, a squad of 13 was selected under the moniker Irish Lightning but the Irish had a difficult first day, losing to Canada and Spain. They picked things up for the final fixture of the day, beating France 19-12. That put Skurr’s side into the Plate competition the next day. A hard-fought win over Germany was followed by an excellent 26-0 victory over Wales. That earned them a 7th-placed final against France, where a Lynne Cantwell try made the difference in a 7-5 triumph. Two tournaments down, and encouraging signs all round. The final preparation for the European qualifiers came the following weekend at the Rugby Rocks Sevens tournament in London. Irish Lightning‘s momentum continued to grow with wins over the Welsh and Austrian national teams before meeting Wooden Spoons in the final. One of the most successful women’s sevens teams around over the last two years, Wooden Spoons would have fancied their chances. But the Irish team’s swift development was evident as they won 26-14 and gave an impressive performance. The speed at which the Irish team adapted to the sevens game is testament to the hard work of the players, as well as Skurr. Obviously, plenty of the 15-a-side international players would have played sevens before coming together, but the high level to which they so quickly developed is incredible. That development was clear at the first official FIRA/AER qualifying event in Ghent on the first weekend of June. Ireland came into the tournament knowing that they needed a top-two finish to advance to the second qualifying event in Moscow. The manner in which they achieved that was nothing short of spectacular. The 13-woman squad won all six of their games without conceding a single point. No other team even got close to them as the Irish racked up an aggregate score of 249-0. A superb performance all round, but Skurr would have been keen to keep the players’ feet on the ground. The achievements in Ghent were highly encouraging, but the standard would of course step up another level in Moscow at this weekend’s qualifying event. Ireland would need a top five finish to guarantee qualification for the 2013 Sevens World Cup. The Irish team got off to a strong start with a 17-5 win over Italy before a 14-12 loss to a strong Netherlands side. That made the final pool game against Switzerland a must-win, and Ireland bounced back in the best possible way with a 43-0 victory. That result ensured a place in the Cup/Plate quarter-finals and meant Skurr’s team were in the top eight at least. They were given a difficult draw against Russia, who were 3 wins from 3 at that point. The hosts proved too strong and Ireland went down 27-0. All was not lost though. With Russia into the Cup semi-finals, it meant that a sixth-place finish for Ireland would be enough to earn World Cup qualification (Russia will host the World Cup, so they didn’t take one of the 5 qualifying spots). The Plate semi-final now became all or nothing for the Irish. Their determination was evident as they beat Ukraine 17-0 despite losing both Jennifer Murphy and Joy Neville to the sin bin for 2 minutes each. Another superb effort and World Cup qualification is secured. The measure of how far this squad has come is that they were probably disappointed to lose 31-7 to the Netherlands in the Plate final. It’s a fantastic achievement and a real boost for those who believe that Sevens has been undervalued in Ireland in recent years. Having seen how hard several of this Irish Women’s Sevens squad train and work at their skills, I can’t say their success has come as a big surprise. These players give just as much time and effort as their male peers despite getting no monetary reward. This qualification is a celebration of playing for the joy of it and the love of representing Ireland. Success brings support and I’m certain that this achievement will bring more interest to women’s rugby, both in sevens and the 15-woman code. The IRFU’s decision to back the Irish Women’s Sevens squad looks like it will pay off in a big way. We’re quick to criticise their failings, so we must credit this success. However, the major congratulations go to the women who made the difference on the pitch. Here’s hoping for much more success and support to come for women’s rugby in Ireland. 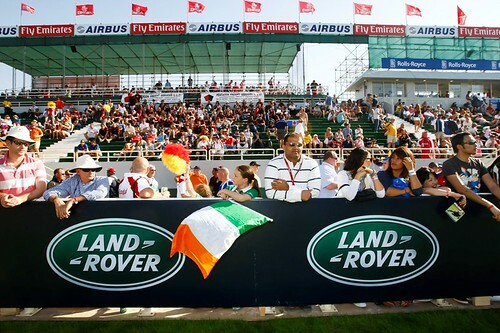 The Irish flag is not being flown at events like the Dubai Sevens on the IRB World Series. (c) landrovermena. The following is a guest blog by Cian Aherne. As the last ball sailed into touch in the Shamrock Warriors’ semi final of the Kinsale 7s, meaning they missed out on the final by one score, one couldn’t help but think the IRFU were breathing a sigh of relief. Another chance for promotion of the game of 7s in Ireland gone, another chance for a summer’s 7s funding disappeared and another reason to get 7s off the ground in this country down the drain. No one sees that the Shamrocks were playing against a fully funded Susie’s Exiles team who had several fringe English 7s players on their side, no one sees that they were made up of AIL players, 90% of whom had never played 7s before, and no one sees that they had actually convincingly beaten every other team in the tournament (including another fully funding touring British side). To think that this group of AIL players, who had only met for the first time on Saturday morning, were as close to winning in Kinsale as an almost fully professional Irish 7s team 4 seasons earlier, shows the enormous potential for a cheap but competitive Irish 7s squad. Because Ireland have not entered a 7s team in this year’s European Championships, 2013 will see the first 7s World Cup, since it’s inception in 1993, without an Irish team. This is a colossal step backwards despite the fact that 7s has now become an Olympic sport, that Irish rugby greats like Alan Quinlan, Malcolm O’Kelly and Denis Hickie have endorsed the game, that Matt Williams has written a letter to the Taoiseach pleading its economic merits, and that Ireland now has an official 7s club. The last 7s World Cup and IRB World Series have shone further light on Ireland’s potential. In the European Championships, 4 years ago this summer, Ireland came within extra time and sudden death of beating the Welsh 7s team in Denmark. Between then and the World Cup a year later, Ireland met for a couple of weeks training, changed 90% of their team and were knocked out in the group stages. Wales, on the other hand, had taken part in the World Series, kept most of the same players and went on to win the World Cup. Kenya have a successful 7s team in the IRB World Series. They sit 11th coming into the final leg in London this weekend. (c) Chris Dickey. The IRFU maintain that Ireland cannot compete at the same level as other national 7s teams yet at almost every major tournament they’ve entered, Ireland have taken scalps over seasoned 7s sides without having had a regular 7s team themselves (France and Samoa in 1993, Portugal in 1997, Tonga in 2005 and Australia in 2009). You could argue that Ireland don’t have the resources of the player base to compete in the World Series like New Zealand, England and South Africa but surely we have as much funding and players as the likes of Scotland, Wales, Australia, Samoa and Fiji. A common myth about Irish 7s is the lack of funding to be competitive. Let’s make this clear, the IRB pay for teams’ accommodation and travel to World Series events. That means all the IRFU would have to pay for is a coaching team to travel. Players could either be paid through their existing provincial contracts or, as I’m sure is the case with the majority of club players, not be paid at all. We don’t need full time professional 7s players to compete, the majority of the Australian 7s team, who recently won the Japan 7s leg of the World Series and the London leg in 2010, are amateur players playing at the same standard as the AIL in Ireland. Ireland currently only have 4 player bases in the 4 provinces, a 7s squad could offer an extremely cheap fifth. If the Shamrock Warriors can get a group of Irish club players together on a one-off basis to compete against and beat seasoned 7s semi-pros from the UK then the IRFU can get the best Irish club players together to compete on a world stage. In fact, they are already doing this with the Club International side who have beaten the English Counties team on 3 of the last 4 occasions. Here again is a demonstration of the funding myth. The Irish Clubs team recently brought together 30 players and coaching staff for 2 international clubs matches. 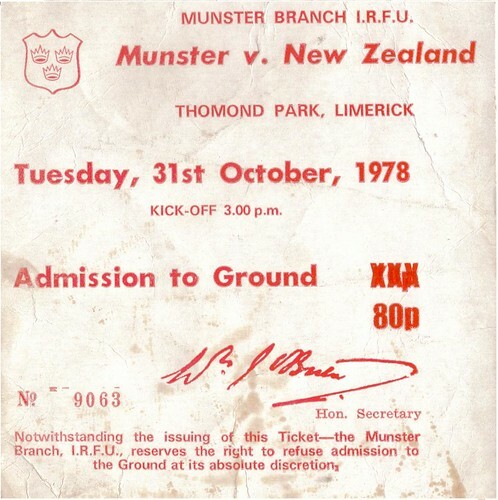 They beat Scotland in Dublin but the result of the second match was not even broadcast on the IRFU website. If the IRFU can afford to pay for 30 players and coaching staff to fly to England, to kit them out, feed them, stay in a hotel for the duration and not even put the result of the game on their website then surely they can afford for less than half of that amount of players to travel to at least one leg of the IRB World Series. The majority of the Australian 7s team, who recently won the Japan 7s leg of the World Series, are amateur players playing at the same standard as the AIL in Ireland. (c) The National Guard. Furthermore, at the 7s European Championships and World Cup in 2008 and 2009, when Ireland were eventually knocked out and encouraged to walk their lap of honour, in spite of never having played these circuits before, there were thousands of fans in the stadiums waving the green, white and gold of Ireland. Ireland is a popular country worldwide and no more so within the festival atmosphere of a 7s tournament. A touring Irish side would offer massive financial windfall in terms of Irish kit sold and the potential for an Irish stop on the IRB circuit. The IRFU’s current stance is that they are trying to promote 7s from a grass root level with provincial 7s tournaments. These have been a flop. They’ve been hosted the weekend after the club league has finished, have seen little, if any, first choice club players playing and most of the top clubs have not even entered teams. Players are not motivated to play if they don’t see potential for success with shabbily run tournaments on the weekend after a long season and no national team to aspire to. It’s a disservice to Irish rugby players that there is an Olympic sport at their doorstep but they are not being given the opportunity to represent their country. The top 7s countries, such as England and New Zealand, have national 7s series’ that top club players are motivated to play in because they know, if they’re good enough, they’ll be selected for the national side and possibly go on to gain professional contracts. Whether it’s seen as a viable option in itself or a feeder system for professional Irish teams, the potential for the success of 7s in Ireland is endless. To promote 7s in Ireland, a team needs to be entered in the World Series for even 2 or 3 legs a year. That would give young Irish players a carrot to chase, a reason to take part in provincial tournaments and pick up vital competitive 7s experience with the chance of actually being scouted and picked for their country. As the IRB Series ends in London this weekend, the goal for the IRFU has to be to enter a team in as many of the circuit’s legs next year as possible. Final food for thought, a list of senior Ireland internationals who have also played for the Irish 7s team: Eric Elwood, Mick Galway*, Paddy Johns, Denis McBride, Vinnie Cunningham, Alain Rolland, Richard Wallace*, Jonathon Bell, David Humphreys, Denis Hickie*, Niall Woods, Eric Miller*, Niall Malone, Ben Cronin, Kieron Dawson, Aidan McCullen, Conor McPhillips, Matt Mostyn, David Quinlan, James Topping, Niall Ronan, Tomás O’Leary*, Kieran Campbell, Felix Jones, Darren Cave, Brian Carney, Ian Keatley, Keith Earls* and Chris Henry (* = Lions Tourist). Photos courtesy: Chris Dickey, landrovermena, The National Guard. Samoa beat New Zealand in the Las Vegas Sevens cup final last weekend with a thrilling last-second try. (c) Chris Dickey. Watching 21-year-old Alex Cuthbert counter-attacking with confidence during Wales’ 27-13 win over Scotland on Sunday, it was easy to see his background in sevens rugby. Every time Scotland sent a poor kick to Leigh Halfpenny at fullback, Cuthbert was immediately off his right wing, head up and spotting openings. While lots of attention focused on the 6’6″ winger’s strength to go through Greg Laidlaw’s tackle for his try, there was less applause for the three occasions Cuthbert scythed through Scotland on the counter-attack. Added to that understanding of space was the intelligence and footwork the Blues wide man showed to set up Halfpenny’s first try. Cuthbert spotted Lee Jones (Scotland 14) coming up hard off the defensive line, so slowed almost to a halt in order to give himself the time and space to burst around his opposite number and supply the scoring pass for Halfpenny. This fleeting piece of skill again betrayed Cuthbert’s sevens history. In the seven man game, preserving space then bursting past opposition is essential. James Hook, Lee Byrne, George North, Andy Powell and Josh Turnbull have all turned out for Wales sevens teams in the recent past. The electric 18-year-old Harry Robinson is the latest man to have made the step up after being included in Wales’ Six Nations training squad. Wales use the sevens game in an intelligent manner, giving young players with potential the chance to play for their country in a relatively pressurised atmosphere as well as increasing certain skills that are key to the union code of the game. The example of Wales is used here because they are a rugby nation with relatively similar playing numbers to Ireland. According to the latest IRB figures, there are 25,440 senior (over-18) male rugby union players in Ireland. Wales is slightly behind with 22,408. So despite having less players to choose from, Wales makes far better use of the sevens code to increase the quality of players in their international union squad. Ireland currently has no sevens team. The last time Ireland were represented internationally was at the Sevens World Cup in 2009. James Coughlan, Paul Marshall and Felix Jones were all involved in that tournament as Ireland lost to Zimbabwe in the Bowl final. Six Nations rivals England, France, Scotland and Wales are all part of the 12 ‘core’ teams in the Sevens World Series at the moment. Despite the IRB’s announcement last week that they will be increasing this core group to 15, we have still heard nothing from the IRFU. The qualifying tournament for those three new places will be held on 23rd-25th March at the Hong Kong Sevens. That event is probably too early, but the IRFU seriously need to consider the advantages of having a sevens team on the world circuit. The commonly accepted excuse is that the IRFU doesn’t have the necessary funds to run a sevens team. By changing their priorities they surely could. Wales chose to have a sevens team rather than an ‘A’ team like the Irish Wolfhounds. Having only played one meaningless friendly against the English Saxons this season, how worthwhile is the Wolfhounds team? Bringing a group of players together for a one-off match with no chance of real reward is basically what the Wolfhounds set-up entails right now. 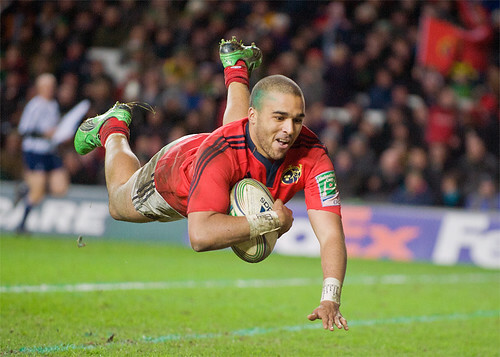 Someone like Simon Zebo would be an ideal candidate for an Irish sevens team. (c) Ivan O’Riordan. That money could be better spent on allowing young Irish players to get out on the sevens circuit alongside continuing development with their provinces. Another potential avenue of funding a sevens team is being more selective in giving central IRFU contracts to players in their 30s (eg. Paddy Wallace, Denis Leamy). How much more can these players really offer Ireland at international level? Would that money not be better spent on increasing the quality and exposure of talented young players? Getting a team into the IRB World Sevens Series would open up a potentially massive money-making event in the Dublin Sevens at the Aviva. The government should be pushing this idea to the IRFU, as they too would benefit from the influx of tourists attracted by an event like this. The excuse of funding doesn’t really apply here and the IRFU must stop resting on their laurels around this issue. With good planning, an Ireland sevens team could benefit our economy as well as, most importantly, our senior international side! The prospect of guys like Simon Zebo, Andrew Conway, Fionn Carr, Rhys Ruddock, Tiernan O’Halloran, Peter O’Mahony and Ali Birch playing sevens in an Irish jersey is an exciting one. The IRFU needs to get a sevens team up and running. Hopefully, they start to see the advantages it could bring. As the Welsh model has shown, the sevens code can give union players unique and relevant skills. Photos courtesy: Chris Dickey, Ivan O’Riordan.